Can setting be a character in a story? You bet. Some places naturally are so exotic, exciting and beautiful that they cry out to star in a movie or book. I’ve read books, wonderful books, set in faraway places. But the settings served only as a backdrop. I’ve always been a little disappointed that I didn’t learn more about the locale during the stories. I love stories where the setting is the framework, especially when the story is set in a beautiful place I want to visit or one I want to revisit. 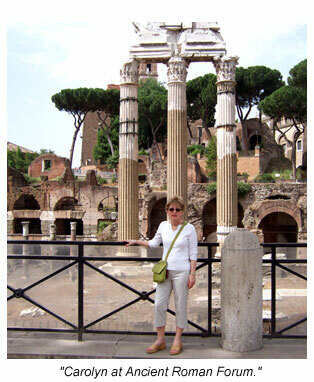 When I traveled to Rome, Italy, in 2006, my second trip there, I was again blown away by the city’s beauty, vibrancy and history. All four of my grandparents came from Italy, so the country itself holds meaning for me. Rome was bustling as always that June, especially with World Cup fever all around. We stayed at a hotel on one of the most popular and crowded streets, Via Corsi. Trevi Fountain was a short walk away. The Pantheon was around the corner. And so was an amazing gelato shop where we bought too many luscious gelatos, the Italian ice cream. Yum. Kiwi Melon was my favorite. My husband and I ate at least two gelatos a day. Good thing we walked all over the city to shed those extra calories. Italy is magical and begs to be its own character in books and movies. As we walked the ancient cobbled streets of Rome, ate amazing food (saffron gnocchi with fresh-shaved truffles, anyone?) and drank lots of delicious wine, I just knew I had to set a story there. And I knew the richness of Rome could never fade into the background. It had to be a character. In the fall of 2009, The Wild Rose Press announced a new romantic suspense series, Jewels of the Night. The stories could be set anywhere in the world, but had to involve a stolen blue diamond. The proverbial light bulb went off in my head. I’d write a romantic suspense set in Rome. 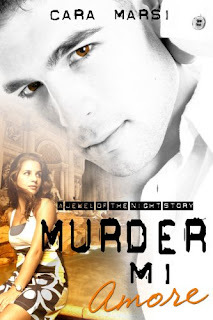 My novella, Murder, Mi Amore, was released in December 2010. Imagine if you were a young American woman vacationing in Rome to get over a painful breakup, and your Roman holiday is suddenly disrupted by jewel thieves, murder, and one very hot and mysterious Italian guy who may or may not be involved with the strange goings on around you. That’s the premise of Murder, Mi Amore. Rome and other parts of Italy are as important to my story as my hero and heroine, Dominic and Lexie. Every scene in Murder, Mi Amore is authentic. Even the meals Lexie ate are the same ones we enjoyed on our trip. The hotel on the Via Corsi where Lexie stays is the one where we stayed. I remember well how I felt as I shouldered my way through the throngs of tourists and natives on Via Corsi. I use these feelings to describe Lexie as she makes her way on this same street after she buys the handbag that launches her wild adventure. When Lexie is dragged through dark and narrow streets by her would-be kidnapper, I pictured the little alleyways dotting Rome. As I wrote about Lexie and Dominic meeting for the first time at Trevi Fountain, I could hear the chattering of the crowds and the snap of cameras and feel the sun’s heat. I could almost taste the wine Lexie orders. When you see pictures of this iconic fountain, it looks as if it’s in the middle of a very wide street. Nope. It’s set in a corner of a narrow cobblestoned street. While writing Murder, Mi Amore I was once again in Rome – running my fingers over the walls of the Coliseum, tramping through the Ancient Roman Forum, eating luscious pizza and drinking rich red wine at outdoor cafes while motor scooters darted around us. A chapter in Murder, Mi Amore is set in the Abruzzo town where my grandparents were raised. Writing that chapter brought me back to the beautiful, mountainous, rural region of my ancestors. On our trip, we traveled the same road to Abruzzo as Lexie and Dominic. However, unlike them, no one was trying to run us off the road into a deep ravine. Could my story have taken place anywhere else? Yes, but I would have lost a major character – an exciting and exotic character, and one a little bit dangerous. Thank you, Laurie, for hosting me today. And thank you, Kris, for your wonderful review of Murder, Mi Amore. What a beautiful picture you paint. Its almost like by reading this book we will be enjoying your vacation along with you. Thank you for sharing that with us. The "Dominic" in the video is quite fetching...I believe I'll picture him in my mind when I read this, lol! From this post no wonder Kris loved this book. I may have to get it one day and read it when I ever get to slow down. Thank you, Laurie, for hosting me. And thank you, Redzsm, for posting. I hope you both get a chance to read Murder, Mi Amore, and that it takes you away to Italy. I want to go back someday. I loved my trip to Italy and everything you posted today brought back my amazing adventure. I do believe real places incorporated in a story make the story more relevant. I do it all the time. Thanks for the giveaway. I would lov eto win this. Vicki, Bethie and Kasumi, thank you for visiting and posting. Anyone who's visited Italy is enthralled by the country. I LOVE setting and believe it can play as important a part as character. And the setting for your book is definitely integral to your plot. Congratulations on your future! Patti, thank you for posting. Setting can definitely be integral to the story. I love it when the location is a character. It isn't always necessary but it is really nice when it is. It's the same with the historical period. I visited Ital years ago. I would love to read Murder, Mi Amore. Thanks for the giveaway. Hi, Jen, thank you for posting. Good luck in the contest. Krystal, thank you for posting. The premise sounds very interesting! I'd love to read it!! And Cara does make Italy a character in Murder, Mi Amore!!!! Love Cara's books!! Darlene and Tess, thank you for posting. And Tess, thanks for your kind words about my books. Thank you for visiting and offering us a mystery. Something a little different. I spent a summer in Rome and it was the most amazing two months of my life... I plan to go back when my boy gets a little older!! I am looking forward to reading this.